Do you like history, archeology, culture, or all the above? Then you will love visiting the Costa Rica Ruins! There are ancient and fascinating ruins surrounded by lush gardens, haunted remains that will give you shivers, and pre-Colombian finds. Most people do not think of a visit to ruins during their Costa Rican vacation, but they truly are worth a visit! The Guayabo National Monument is an archaeological site on the southern slope of the beautiful Turrialba Volcano. The impressive ruins are in the midst of lush tropical rainforest. When you visit Guayabo, you can see ancient stone carvings, streets, and bases for buildings. Currently, Guayabo is the largest discovered archeological site in Costa Rica. It is believed to have been populated by over 10,000 people from around 1000 BCE to 800 CE and that it was an important center for culture, religion and politics. Guayabo was mysteriously abandoned for unknown reasons before Spanish colonists discovered it. Nobody knows what happened to the population of the city but two hypotheses are that most of them were killed by a plague or in a war. Right in the center of Cartago, you can find these beautiful ruins, Las Ruinas de la Parroquia. Built by the Spanish in 1575 this beautiful convent was dedicated to Apostle Santiago. In 1841, it was destroyed by a tremendous earthquake. The church was rebuilt but it was damaged again by earthquakes several times. Then in 1910 the Santa Monica earthquake damaged the church and it was decided not to rebuilt it anymore. What you see today are the remnants from that fateful earthquake in 1910. There is a popular legend that the site is cursed because a priest killed his brother in the church. Legend has that you can even see the headless priest wandering around in foggy nights. The foothills of the Irazu volcano house a bit of dark Costa Rican history. The Duran Sanatorium was founded in the early 20th century started out as a tuberculoses hospital but was later also used as a place to house the mentally ill and later an orphanage and a prison. As well as earning a spot as one of the most fascinating ruins in Costa Rica, it is also the most haunted location in the whole country. This Sanatorium is best visited as part of a day trip to Irazu and the city of Cartago. If you happen to be traveling near the Orosi Valley, you should take the time to stop at this beautiful church. 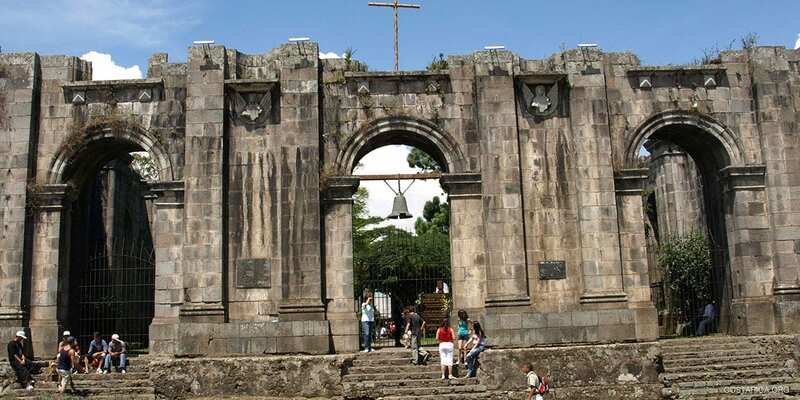 Ujarrás contains the ruins of the oldest church in Costa Rica which date back to the mid-1500s. In fact, it was originally a Spanish Colonial church and you can see the influence from Spain in the design. After a devastating flood, the population of Ujarrás abandoned the town to find better living conditions elsewhere. Today, the ruins of Ujarrás church are surrounded by beautiful gardens where many Costa Ricans spend their Sunday afternoons. They remain there as a witness to the town’s tragic history. The ruins are truly a site to see! Located just 8 kilometers from Puntarenas lies the San Lucas Island with its infamous prison. This was once the most important prison in Costa Rica and a visit to it takes you back into the gruesome past of inmates. It opened in 1873 and operated for an impressive 118 years! It was built on San Lucas Island to keep the worst criminals of the country away from society. The San Lucas Prison gives a glimpse into what life was like and graffiti in the cells depicts a brutal imprisonment. San Lucas prison officially closed in 1991 and is a National Wildlife Shelter now. So what are you waiting for? Experience these fascinating Costa Rica Ruins, a great point of interest.